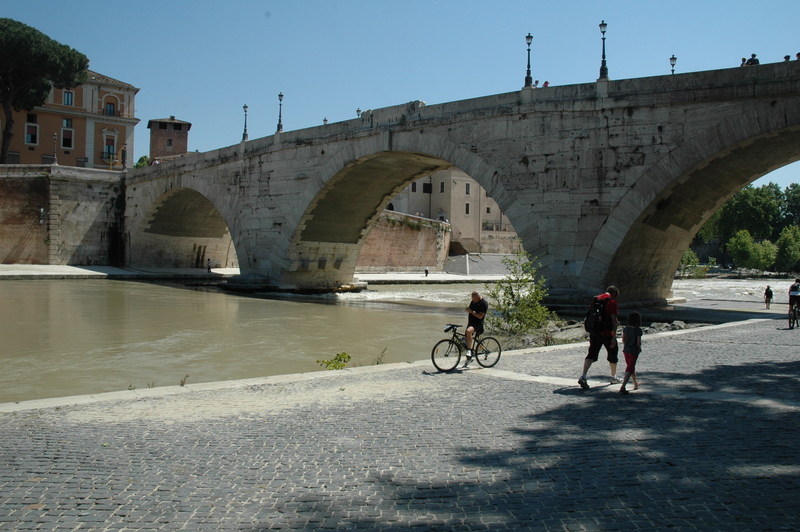 Why can't the Tiber serve the city's transit needs? Recently I was interviewed in my studio for a CNN show called “Future Cities“; the first episode just aired addressing the challenges of public transit in Rome. Much of the program, including the Mayor’s interview, repeats the old story about how Rome has a very limited underground metro system due to the presence of archaeology which makes construction slow and expensive. More interestingly, Engineer Antonio Tamburrino, one of the participants of the 1972 Club of Rome with whom I have been discussing urban sustainability of late, instead presents an innovative project to pedestrianize the historical center and surround it with a ring of surface light-rail, a smart alternative to heavy underground trains (which are last century’s technology). Since the only clip they used from my own interview was a short, rather silly soundbite, I want to dedicate a blogpost in which to share my more complete views on this important issue. It has become a cliché to say that Rome is structurally not well-adaptable to transit because of its archaeological layers or to bicycling because of its hills. But it is not cultural heritage or topography that stand in the way of a more livable city. In truth, the single greatest menace to the city of Rome and the one for which the solutions are the most obvious and yet the most elusive, is automotive traffic. Cars clog the streets and pollute the air, not to mention inflicting a startling human cost,: an average of two pedestrians die in Italy each day, mortalities from accidents are about one an hour, not even counting the health costs and economic damages. We hear a lot about the Traffic Emergency, but when we look at the details the solutions are often the creation of parking structures, the widening of streets, drafting of new laws, etc. I’m convinced that the simplest solution lies in simply enforcing the existing laws regarding motor vehicles. Despite a relatively high 50km/h speed limit throughout the city (London has lowered its to 30), cars can be clocked at double this on Via Fori Imperiali near the Colosseum where a young cyclist was killed two years ago. Despite parking restrictions typical of most European cities, autos can be seen everywhere in violation and rarely fined. This has been long accepted as sign of Italy’s famous flexibility with regard to the law, turning a blind eye to minor violations, but urban residents are starting to get fed up. I work with a number of pedestrian advocacy groups and public space planners and, thanks especially to the web and to blogs like my own, initiatives to fight the automotive addiction are growing. Fed up with the lack of enforcement of parking laws we have started distributing our own symbolic citizen’s fines, attempting to sensitive drivers to the fact that their personal convenience comes at the price of the rights and safety of hundreds of pedestrians and cyclists, children and elderly, people who are consuming no fossil fuels and producing no emissions. Our goal is to shift the balance back to a mix of public transit and walking/cycling. Rome’s public transit network, in particular its buses and light rail, is potentially one of Europe’s best, were in not for the congestion of private vehicles and inconsistent management. I’m convinced that given a choice of a clean, efficient transit system and pleasant safe streets for walking and cycling, counterbalanced by costly and rigorously enforced parking restrictions, most Romans will eventually overcome their automotive addiction. Re-design the ATAC bus routes rationally, with public participation and the use of web 2.0 technology. At present, there are routes that run almost empty (the 125 on the Janiculum for example) and others where the buses are consistently packed. I have an idea for an application which would allow users to propose bus routes using Google Maps data and social networking protocols to optimize routes. I am convinced this kind of participatory design is the future. Eliminate the capolinee (bus terminus) from the city center and draft believable bus route schedules. In redesigning routes, ensure that the buses are always moving smoothly according to a rigorous schedule, not sitting idly occupying public space. This is possible in most European cities; there is no valid reason that it cannot be so in Rome. Give transit universal precedence over private automobiles, just as is done with emergency vehicles. Drivers that don’t get out of the way of buses are fined. In addition, program traffic lights to give transit green lights when approaching. Reintroduce trams on the Lungotevere, Corso Vittorio, Via Nazionale and Corso Rinascimento. Clearly this must be part of a comprehensive transit plan, but it shouldn’t be put off. Case studies from other cities from Zurich to Portland show that trams more than buses demonstrate the permanence which encourages people to make the switch to transit, bringing positive change to the neighborhoods where they pass and the city as a whole. A tram along both sides of the Lungotevere, in conjunction with the creation of a protected bike path (instead of the shared sidewalk cyclists are told to use today) would give people a clear and clean option to move through the city and by narrowing the road discourage rather than incentivate private automotive traffic. Reintroduce navigation on the Tiber; this was already done several years back. The concession arrangement which allowed a private company to operate tourist cruises in exchange for providing a public transit services was inexplicably suspended and now only the tour boats are running. For my son to get from his high school to the rowing club where he goes after school takes three buses which zig-zag across the city but could be done by one straight ferry trip up the Tiber (or one tram or bike ride along the Lungotevere)! Actually, there is a wealth of information out there about VAL systems, trams on tires, etc. worth perusing. I look forward to speaking again with Prof. Tamburrino about the details of his project. This link was passed on to me by Paolo Ercolani. It is a clearinghouse for news on Metro B1 and C organized by the Portale dell’Eur. http://www.eur.roma.it/news.php?cat=17 e http://www.eur.roma.it/news.php?cat=9?